Man probably wanted to fly as soon as he first saw birds in flight. The Greek mythological tale of Icarus and Daedalus, which may have been first told as many as three thousand years ago, evidences this long standing dream. It also provides some evidence as to how man first thought he might accomplish this task . . . by constructing wings of a design similar to those of birds, strapping them on and taking off. The idea of copying birds, something men obviously knew could fly, clearly didn't die with Icarus. Man's early attempts at powered flight often followed the same logic and, not infrequently, followed with the same fatal results. The above video, featuring some of those early efforts, seems pretty funny now, but it's only funny for one reason . . . they failed badly. If, somehow or some way, they had proven successful, these anonymous pioneers would be well remembered just like the pioneers who were successful are to this day. Of course, the successful pioneers, like the Wright Brothers, are well remembered and, not surprisingly, they were successful because they thought outside the box and solved the problems of powered flight by drawing on knowledge their contemporaries didn't consider. Orville and Wilbur Wright's key breakthrough was their invention of X-Y-Z axis control, which allowed pilots to steer the aircraft effectively and to maintain its' balance. Their work with bicycles, of all things, led them to believe that an unstable aircraft could be controlled and balanced with practice. This concept became the standard for fixed-wing aircraft of all kinds. For the brothers, control was the key to solving "the flying problem", instead of using more powerful engines as some other developers did. Aviation advances moved along quite nicely for almost a half century and planes flew further and faster until they reached the sound barrier, about 760 mph. When experimental planes tried to break it, the controls would lock, the pilots would lose control, the planes would break apart. Many scientists and engineers thought cracking the sound barrier in a plane was just physically impossible, just like scientists today consider faster than light travel impossible. The death of British test pilot Geoffrey de Havilland Jr. while testing out a de Havilland DH.108 in 1946, cemented this idea in many minds. The plane literally disintegrated around him. How did the American project engineers solve this problem? Well, a bullet can travel faster than sound, so they decided to shape the Bell x-1 like a .50 caliber bullet. Advances in aviation have always involved a lot of guesswork with a slide rule and in 1947 they guessed right and broke the sound barrier with the X-1. Something else also happened in 1947 . . . it was the dawn of the modern UFO era. Now let's take a step further back in time and examine a couple of startling examples of man getting it wrong and what it says about us. The flat Earth model of our home planet was a misconception that stayed with us for far too long, some fools even clinging to it into the 20th century. And while some cosmologists, like Pythagoras of Samos and Parmenides of Elea, figured out the Earth's spherical nature more than 2000 years ago, their ideas weren't widely known in a pre-printing press world. Most people thought the world was flat and that was the case until a handful of centuries ago. We find another striking example of this two-dimensional thinking in the arts. Filippo Brunelleschi created the first known paintings demonstrating the concepts of linear perspective and vanishing points in Florence, Italy. He showed artists for the very first time how they could paint their paintings and make three-dimensional objects in them look just like a mirror would reflect them. Before long, the principles of linear perspective became the standard, an artistic tool used to this day for presenting realistic renderings. And when did Brunelleschi come to this revelation? 1425! That's 1425 A.D.! Man had been creating images on flat surfaces since the days of the caveman. Carbon dating of the cave paintings at Lascaux in France tell us they are 36,000 years old. It's funny if you think about it . 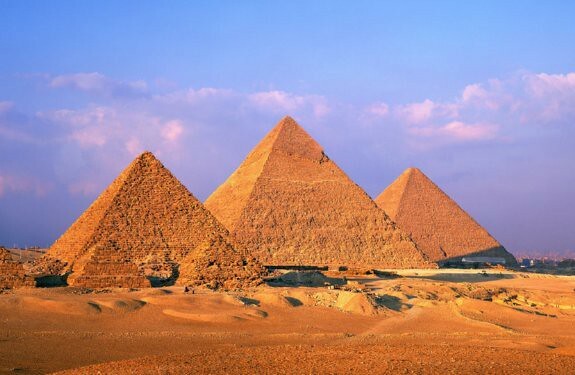 . . the ancient Egyptians could build the Great Pyramids but they couldn't draw them properly! So now we return to UFOs, or flying saucers, and man's occasionally two-dimensional way of thinking about them. Looking at the Avrocar, a literal copy of a flying saucer, you have to wonder why a vehicle like this would even be built if engineers didn't think some UFOs were actually alien visitors. Ultimately, it didn't perform anywhere near as well as promised and was scrapped in 1961, a couple years into the program. Other projects, which also seem to have been clearly inspired by UFOs, like the SR-71, did much better. It is my belief that programs like these provide some of the best evidence for alien visitation. Why follow the historically human path of copying what we see and trying to make it work for us if it doesn't exist? And while it seems certain cutting edge aviation engineers since the 1950s have done exactly that, there are enough witness descriptions of UFOs and their extraordinary capabilities to make some reasonable speculations about what influenced and inspired aliens in constructing their vehicles . . . not birds, but sea life. 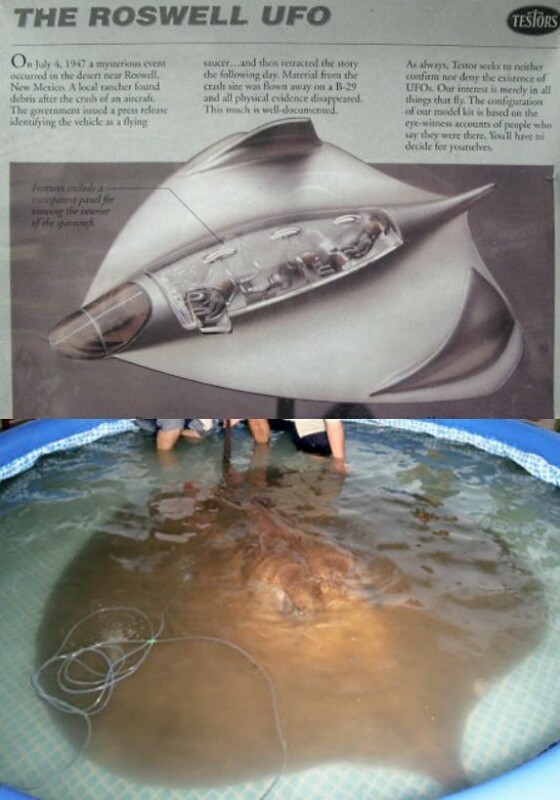 The morphing memory metal as described by Roswell witnesses seems evident in this video . . .
. . . and the vehicle, based on witness accounts and visualized in a film on the Roswell incident, looks amazingly like a hybrid of a manta ray and a stingray. Also, consider the similar, albeit more sharply angled at the edges, design of the X-47 drone pictured in the header for this article. Could the movie version of the Roswell ship be nothing but artistic license? Possibly, but there's more . . . Consider the reports of UFOs able to instantly appear or disappear. Is it an example of crossing dimensional thresholds on a whim or something a bit simpler? Consider witness accounts of lighted UFOs, sometimes multi-colored, sometimes the entire vehicle glows. Skeptics might ask why would advanced aliens need lights on their vehicles at all? I ask if they are merely inspired by the bioluminescent aquatic life from their home planet and using it to attract attention and recognition when it suits their needs of the moment . . . just like marine life here on Earth. I think to a great extent, we humans can still be very much “flat Earthers” thinking in only two dimensions. A few of us have dragged the entire species forward through great discoveries in their areas of expertise, but most of us remain intellectual remoras. I think that it's generally agreed all life came from the water, but we've been evolving so long on land that it's fair to say that being land-based is, in fact, our nature. No amount of time spent sailing or scuba diving or water skiing can change that. Michael Chorost, technology theorist and author of World Wide Mind: The Coming Integration of Humanity, Machines, and the Internet and Rebuilt: My Journey Back to the Hearing World, wrote recently in his blog,"it’s hard to develop tools without access to fire and the metalworking it affords. But that could just be my carbon-based, air-breathing, tool-using, bipedal-locomotion biases speaking. Perhaps there are forms of aquatic intelligence on other planets that focus on mimicry and language. Until we get to meet E.T., we really can’t know what aspects of intelligence are inherently universal." Of course Chorost raises an excellent point, but what if the truth is really quite simple? What if aliens really have been continually visiting us for thousands of years? What if their interest in us is due to our ground-based, "two-dimensional" psychology which is so different from their own? What if our close relationship with oceans, lakes and rivers, despite our ground-based nature, is of particular interest to them as well? What if their highly developed aquatic intelligence, based on living and evolving in a “3-D” environment, is better suited to more creative thinking and problem solving? If so, what can we gain from that and how can we do it? What if they themselves were genetically engineered from their natural aquatic physical state, perhaps with DNA culled from a species much like us, so they could leave the water and develop the technology to fly to the stars and find themselves? More likely interdimensional movements performed accidentally by beings in another of the many dimensions deemed probable by Stephen Hawkins..Visitors from distant planets would have to own a space warp technique that would do harm to our planet if used.. The how of interstellar or interdimensional or time travel seems like the catch . . . for now. Liked the bit about UFO's using camouflage/shapeshifting as a possible explanation of how they seem to disappear so often. Could have a lot of truth to it. Hiya Frank, very enjoyable post...nice introduction and background. The manta ray has been described in a few UFO reports recently. 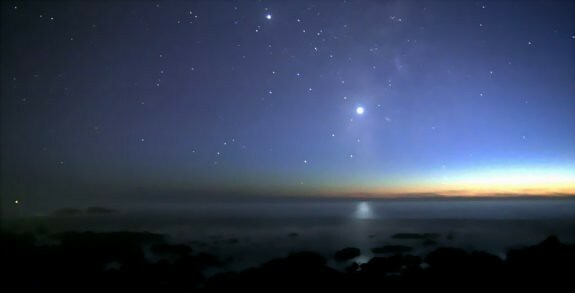 Whether they are true is anyone's guess, but they've been described as resembling and moving in a similar way to rays. If you listen to the excellent 'Mysterious Universe' show, they get a mention. About the variety of life-forms? Could be, who knows? That humanoid shape seems to be the most likely according to reports. Some of Mike Swords' ideas have really stuck with me on that subject. Thanks for stopping round, Mr. K! Thanks for that Mr. K! I found this documentary last night and while it's not the greatest overall, I was pleased to find a brief interview with Bill McDonald, who designed the Roswell ship for the cable TV movie and the Testors model pictured above. The interview comes in just after the 31 minute mark.